The NC ADA Network supports grassroots groups, led by people with disabilities, to conduct projects that promote voluntary compliance with the Americans with Disabilities Act (ADA) in their local communities. The Fiscal Intermediary provides timely, accurate reimbursement for the funding of Network Affiliate Group ADA initiatives and participant travel/training expenses. Celebrate the ADA's 28th Anniversary with us! Click here. Approximately 19% of the non-institutionalized population report having a disability. Persons with disabilities are twice as likely as those without disabilities to be unemployed, have inadequate transportation or go without medical care. The federal Americans with Disabilities Act (ADA) signed in 1990 stemmed from a growing recognition that policies, societal barriers and prejudices were key factors in producing these outcomes. The ADA prohibits discrimination and guarantees that people with disabilities have the same opportunities as everyone else to participate in the mainstream of American life – to enjoy employment opportunities, to purchase goods and services, and to participate in State and local government programs and services. 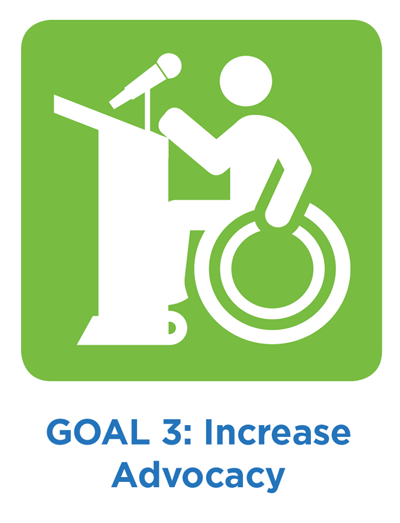 This initiative supports NCCDD's Goal 3 of the new Five Year Plan: Increase advocacy for individuals with I/DD. In order for individuals to benefit from the provisions offered in the ADA, federal, state and local entities must effectively implement and put these laws into practice. The ADA National Network consists of 10 regional centers and an ADA Knowledge Translation Center distributed throughout the US to provide local assistance and foster implementation of the ADA. The North Carolina ADA Network is a collaborative initiative of the Southeast ADA Center and the North Carolina Council on Developmental Disabilities (NCCDD). ADA education and training including local in-person training, webinars, audio-conferences and web courses. Dissemination of ADA materials and publications with accurate, up-to-date information about the ADA. Public awareness activities that increase ADA awareness and knowledge (including exhibits, presentations and media). Over 23 local grassroots groups, led by people with disabilities, from across North Carolina are active members of the NC ADA Network. In 2014, these groups conducted or hosted Americans with Disabilities Act (ADA) projects and activities in 44 counties across the State. Development of state and local partnerships to implement the provisions of the ADA. Build a network of hundreds of community leaders who can advocate for greater accessibility and inclusion, and can train others in their local communities to make improvements that support individuals with disabilities. Integrate leaders into each community who are regularly called upon as a resource for improvements in disability policy. Shift attitudes and expectations with respect to the contributions individuals with disabilities can and do make as employees in our workplaces and engaging in our cities and towns. Multiple local community projects across the State have addressed accessibility and transportation, how can I get involved? Americans with Disabilities Act: Starting the Conversation with a Business: A Leader’s Guide: https://www.adasoutheast.org/publications/business-guide/ada-conversation.pdf This was created by the NC ADA Network in collaboration with the Southeast ADA Center.